When Instagram Stories launched last year, users were shocked. The immediate reaction on social media was that it was shamelessly copying the popular Snapchat feature. But, that wasn’t necessarily the case. Instagram CEO Kevin Systrom gave full credit to Snapchat, and added that a story “is about a format, and how you take it to a network and put your own spin on it.” Social media channels like Facebook, Twitter and Steller are now implementing this format and allowing their users to serve content in a more dynamic way. Since this method of storytelling has become so popular, I gathered information about how users are implementing this format and what its limitations are. Steller is one tool that I am most excited to share. This storytelling mobile app and social network allows users to combine pictures, videos and text to create longer-format stories. 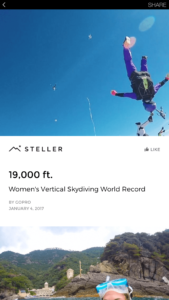 I’ve been using Steller since its launch in 2014, and I am a huge fan of how it showcases content. My favorite part is how great the stories look when I share them on other channels. However, a few days ago I started to question whether the Steller platform is still effective for sharing my content because I haven’t seen much pick-up within my community. 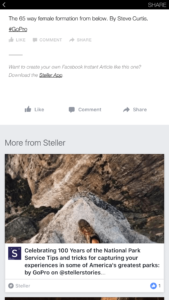 But, as I looked into the reasons why, I discovered that Steller recently partnered with Facebook to integrate Steller stories. This gives each story an instant lift, as it appears as a Facebook Instant Article on mobile. As a designer and social media marketer, this smooth user experience is exciting news for me. It means that I can share beautiful stories with photos, text and videos that auto-play with my followers — and, the stories will load quickly! 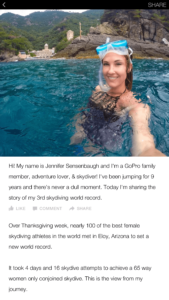 Unlike Facebook Canvas, Steller stories can be viewed on desktop and still look great. 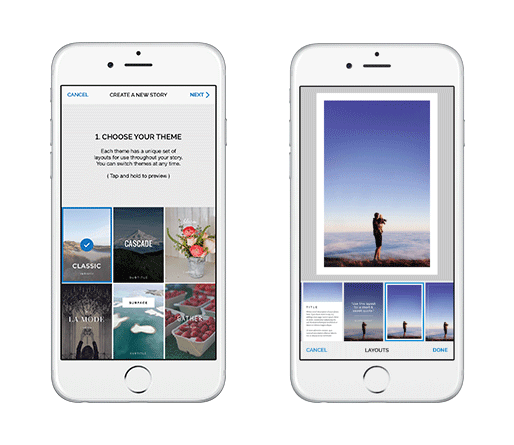 Facebook Canvas is an “immersive and expressive” take on the storytelling format that allows businesses to tell stories and showcase products. Canvas allows the user to flip through a carousel, tilt to view panoramic images and zoom in to view detail. In my opinion, the best feature of Canvas is that it can include a call to action button. Canvas, like Steller Stories on Facebook, is intended to load fast and offer a seamless experience. However, even though it’s very flexible and dynamic, Canvas has limitations. Canvases are built only for mobile, so there will be an error if a user tries to view on desktop. Therefore, the most common use of Canvas is for ads. Instagram launched its “Stories” in August of last year. It allows users and businesses to share everyday moments (even the ones that don’t need to stay on the feed), but avoid oversharing. Instagram Stories can include photos, videos, and boomerangs in which you can add text, draw, and also do live broadcasting. Since the launch, more than 150 million users are using Instagram Stories daily and businesses have seen high engagement. Instagram also says that one in five stories on Instagram gets a direct message from viewers. However, many clients struggle with strategy and creation of daily relevant content for these features. 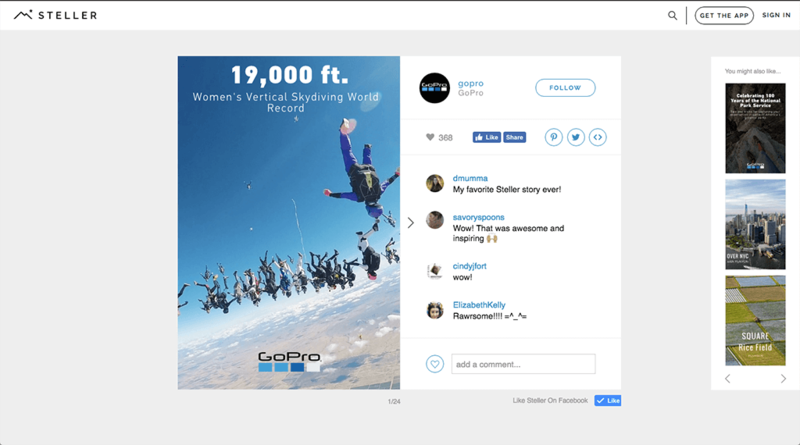 The good news is that Instagram recently introduced a series of tools to help businesses: full-screen ads in Stories and Stories Insights. Ads in Stories can use targeting, which serves ads to the specific audience you want to reach. Stories Insights allows business profiles to see the reach, impressions, replies and exits for each individual story. Several big brands are testing Instagram Stories ads and it’s expected that they will be adopting the format soon. Linking from stories is a feature that is being tested and is only available to verified accounts. I anticipate that this feature will eventually become available to non-verified business’ ads, as well. Snapchat, considered the pioneer of this storytelling format, says that 150 million people use the app every day and watch over 10 billion videos per day. This makes it a very popular channel for brands to deliver brand messaging or drive particular actions. Snapchat reaches over 41% of all 18- to 34-year-olds in the United States on a given day. The same team that created the Snapchat consumer products has also worked on a variety of ad products to help brands reach their goals. These include video advertisements where you can swipe up and read an article, launch an app installer, show a long-form video or quickly access a mobile web page. Later last year, Twitter opened its Twitter Moments feature to all users. This allows each user to curate a series of tweets to create a slideshow version of a “story”. The way this canvas displays the story is different from other social media channels. Photos, videos and GIFs are included with a tweet that appears at the bottom of each slide. Always accessible from your Twitter profile: When you create a Moment, it is saved under your profile and can be shared any time or edited later to add more tweets. Building stories together: Moments allow a user to interact with the community. Twitter Moments showcase tweets from influencers or users that interact with your brand or campaign, strengthening the relationship with your community and making a collaborative story. The strategy might differ from other social media channels. Since the format of this feature is different from the other social channels, there is a chance the strategy and the way you tell your story on Twitter through Moments will change. I personally see Twitter Moments as a tool that comes at the end, as the story has already been told through a period of time, to tie it all together and as a way to repurpose content one more time. 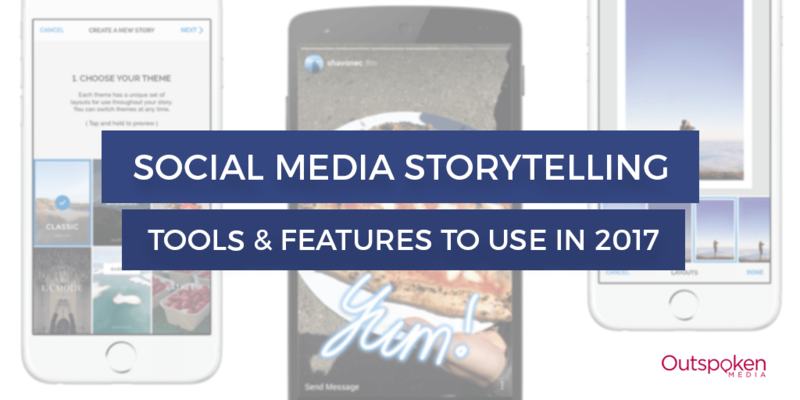 I’m excited and have too many questions after exploring these popular storytelling tools and features. Is Facebook going to allow users to share Instagram Stories on Facebook and display as Instant Articles? Are we going to see more storytelling apps popping up? How are brands going to use the storytelling format to improve “customer experience”? I look forward to seeing how this storytelling format is evolves (or not) and how both brands and users continue to create and consume content. Are you thinking of using any of these channels to create stories? Are you as excited as I am? Share your thoughts in the comments below! Leo is Outspoken Media's Visual Communications Manager. The short list of his many capabilities include designing branded materials, creating unique illustrations for clients’ blogs, websites and other collateral. Leo enjoys traveling, photography and blogging.